The information in this article is nothing new. If you’ve read ‘Bounce’ by Matthew Syed or it’s predecessor ‘Outliers’ by Malcolm Gladwell or any number of magazine and newspaper features, blog posts such as this one by 11Tegen11 or most recently on the BBC website. All of these make the point that it can often be the month of your birth that determines your success. At the heart of the theory is a piece of work conducted by Roger Barnsley who first spotted this when referencing an ice hockey team in Canada. It also has its roots in the work of Anders Ericsson who has studied talent for many years. In very broad terms the theory suggests that players are more likely to be scouted if they are born in the first few months of the selection year. For example, if the recruitment year is September to August as it is in football in England then it’s possible to have one child playing with or against another child who is almost a year older. Child A could be born on the 1st September and Child B is born on the 31st August. Consequently Child A has almost a year more of growth in his bones and would give him a considerable advantage in height, strength etc. The theory suggests that these children are scouted as they can physically dominate their smaller counterparts. They then go on to receive the best coaching and advance their development. The reason it’s being explored here is mainly by pure chance. No new insight can be given on the matter here, but a new data set can be analysed for similar patterns and shared. That chance came when viewing a website (sorry, I cannot remember the site) that listed all the players that have played for Blackpool. Dates of birth were listed, so an opportunity to test the theory came about. The results of that testing will be shared below. There are caveats around this data*. Firstly, it is in no way a definitive list. Secondly, no referencing to other data sources has taken place to ensure accuracy. Thirdly, some players had dummy dates attached. Fourthly, a small number of the players were born in the 19th century and perhaps not subject to the same forces as their modern counterparts. Lastly, some of the players are from countries outside of the UK and their recruitment years will vary. The first sort of data produced the graph below. This show each player’s birth month categorised in a calendar year. For instance, you can see that there are 32 players born in January. What should be immediately obvious is the spike that occurs in September. 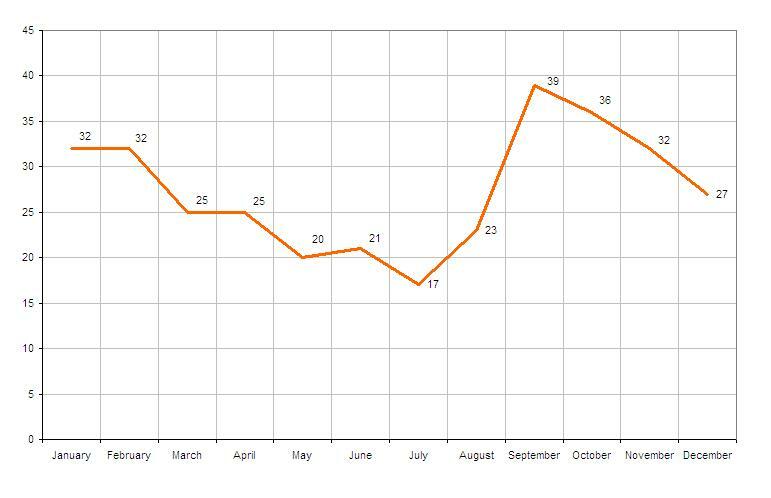 In fact the highest month is September at 39 players and the lowest is July with 17. It seems a relatively compelling illustration of the birth month theory. In order to make it more compelling the data has been re-ordered in to the months of the recruitment year, September to August. You can see the outcome below. 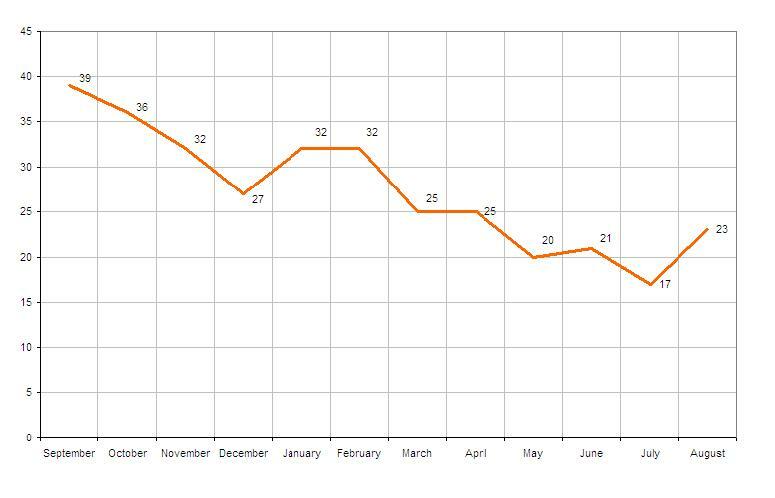 This perfectly sums up the bias towards the recruitment of players in the early months of the recruitment year as you can see the line tail off over the course of the year. This has been done purely because it was of interest to try this with a new set of data, what won’t be done here is to delve any deeper. The books mentioned earlier provide superb material to keep you thinking and are highly recommended. However, it is of interest about how you can get round such bias. The sooner football clubs can get around this then the more likely children will be brought in to game with more game specific talents, such as speed of thought, vision, creativity and less around the physical attributes that are easier to monitor. For a club like Blackpool this may not necessarily need to be a factor as their youth programme produces relatively few first team players, but if the national game is to step up then this is an area that must be overcome with extensive work and improved scouting skills. *338 players were listed on the site. 9 were removed as they had no date of birth attached, therefore 329 players formed the data used here.